The tiny cabins are not just about looking cute but they are also part of a expanding tendency that encourages the sustainable way of living. And that includes cutting electricity and water consumption as well as not being a slave of the material possessions. More and more interior designers and housebuilders have figured out innovative techniques to make these 20 square meters tiny home cabins wonderfully well-equipped and practical so they can replace the traditional large, expensive, difficult to maintain homes. Is that sounds too unrealistic for you? 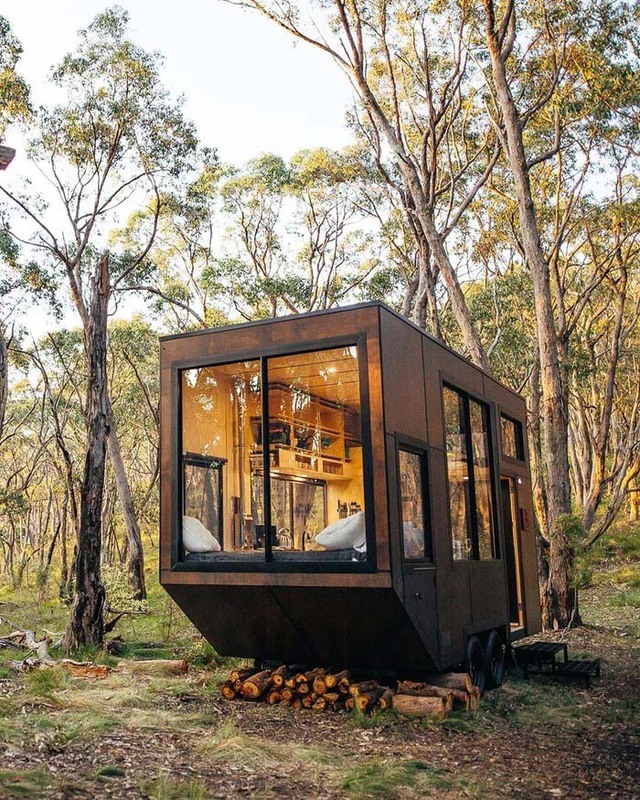 Why don’t you have a look at my list of 25 amazing tiny portable cabins to get some inspiration? 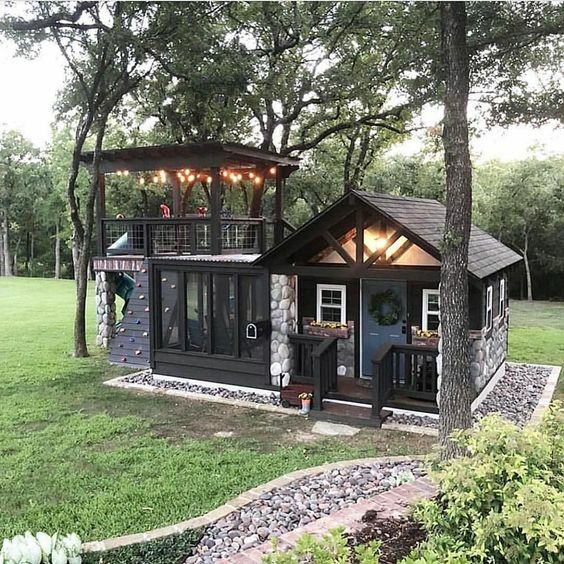 Built of rain-screen cedar and solid rock siding for extra stability, this cozy bungalow in the woods is full of custom features, including a welcoming, fully functional tiny porch where you can enjoy the view. 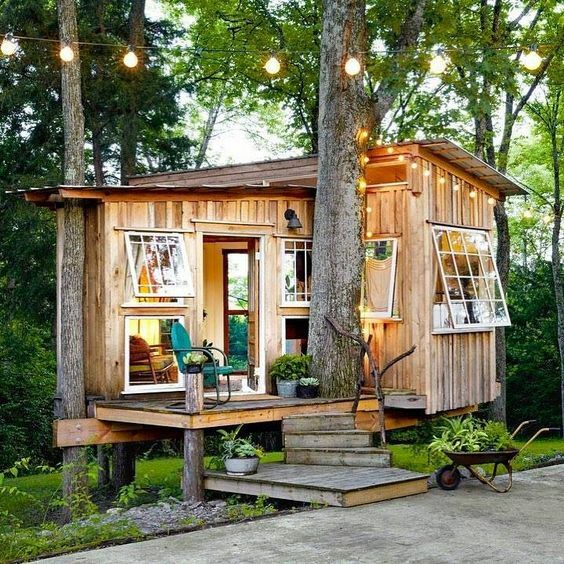 Similar to most of the tiny log cabins, this cute pine-and-cedar bungalow (on the picture above) is constructed atop a metal truck trailer. Can you believe it features a kitchen counter with a propane one-burner, a sleeping loft for 2 people, solar-powered lamps, a shower, composting toilet, and a sink? Formerly a corn and crop barn, this small, two-floor cottage which, I bet, you would all acclaim as a romantic getaway, might be the best choice for your next family holiday. 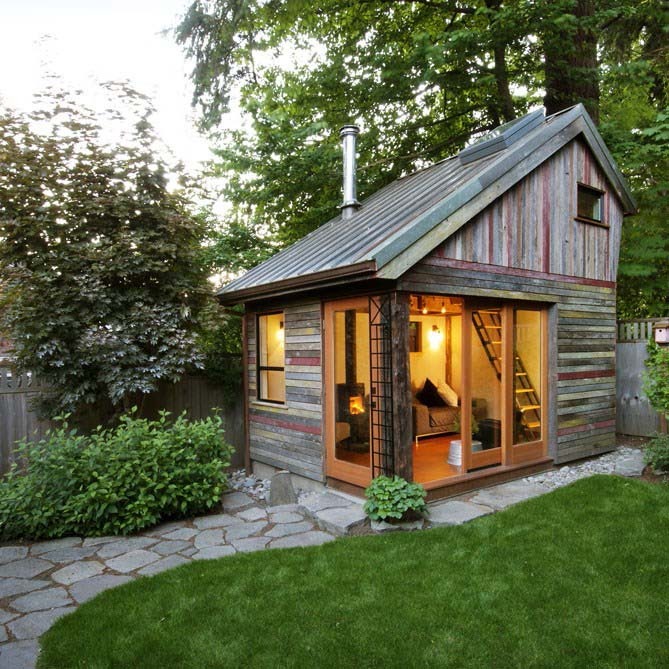 The blogger Megan Lea has made this petite backyard house out of reused materials. It looks remarkably cozy with that fireplace and comfy sofa…it might be hard to leave it, right? The cedar wood perfectly contrasts with the blackboard and baton siding that surround the bay window of this tiny bungalow. 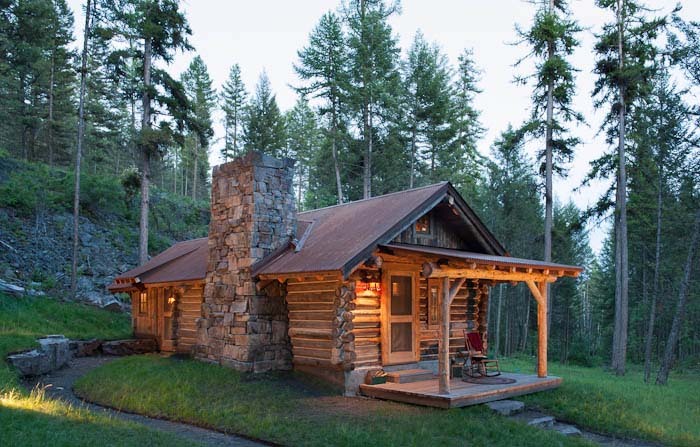 As most of the tiny cedar cabins, care has been taken to use eco-friendly materials, from a solid bamboo countertops to the handcrafted light fixtures. 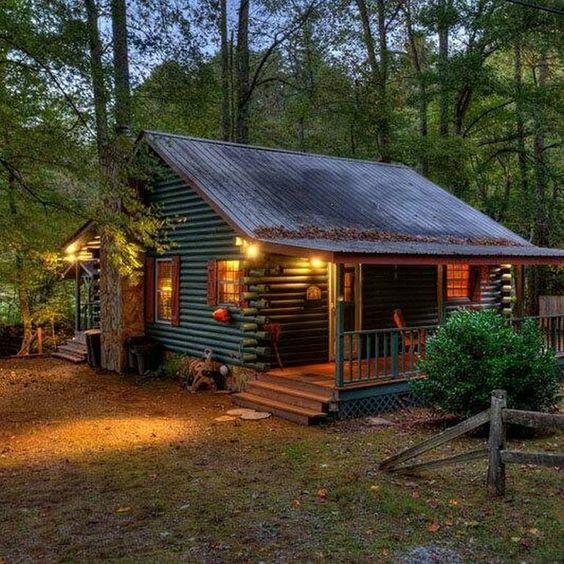 This little home comes complete with everything you will need for a proper vacation away from the office. The large windows let the natural light entering the bungalow which makes more welcoming and cozy. 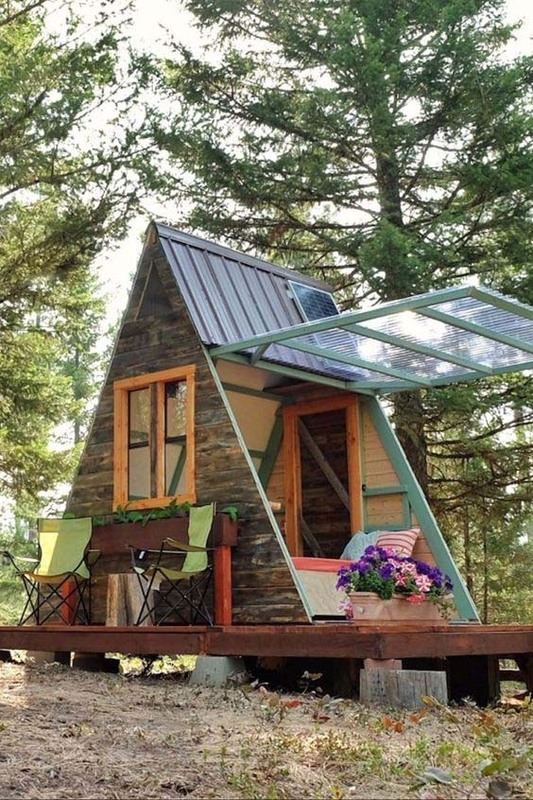 This might look as a tiny luxury cabin but it’s really a mobile Park Model RV. This amazing combo between contemporary and rustic features a bedroom, bathroom, and joined kitchen – living room area. The little deck creates an additional space for relaxing in the breezy summer nights. 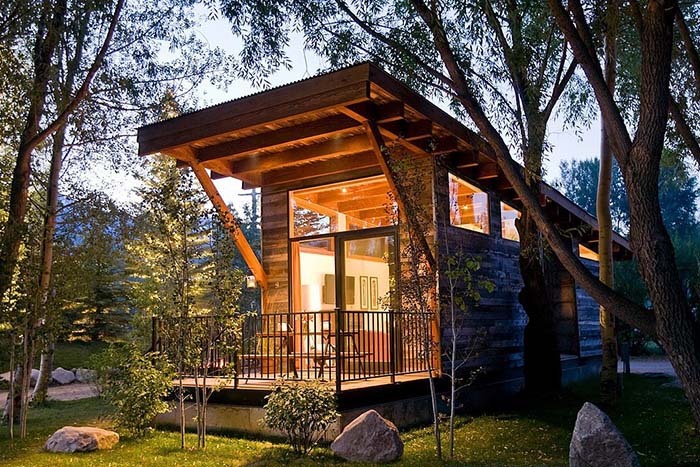 Most of the tiny house cabins attract with their simple and very practical design. The one on the picture above, for instance, forms an intimate and private space with definite visual bond to the landscape. Far in the woods of Northern California, this primitive wooden bungalow is a great example of how to build a home with reclaimed wood and old windows from real ships. 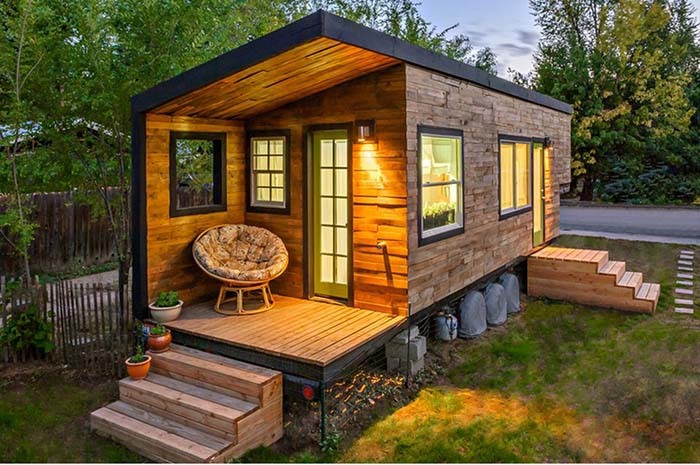 One of the key ideas underlying in the concept of the tiny homes cabins is to live more sustainable. In this line of thinking, having more windows means more sunlight and lower electricity bills! Thinking of add a pinch of rustic in your life? Then check out this A-frame, hand-built cabin home with a spacious porch where you can gather your friends and family. The A-shape won’t allow the snow to stack on the roof. 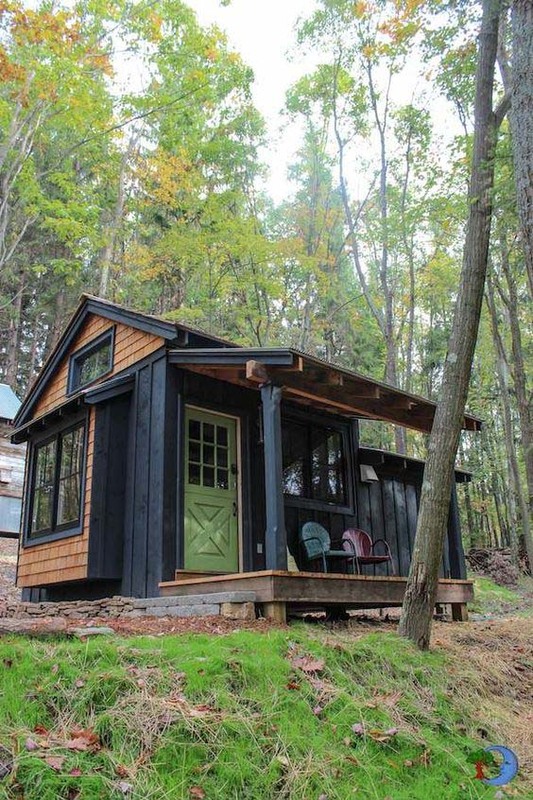 Located deep in the forest of the Tyringham Valley, this tiny wooden studio is the perfect hideaway spot for every family. The large deck would fit up to 10 people so you can all freely enjoy the bird songs while sunbathing. Settled on the edge of a forest and on a railway line, this tiny cottage was formerly a railway master’s house. 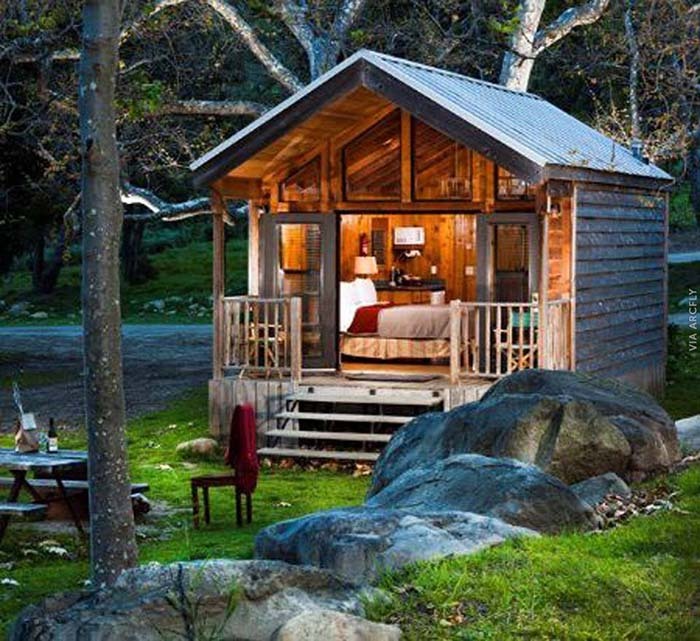 It might not offer the luxury the other tiny cabins do, however, it is a true escape from the stress of the everyday life. 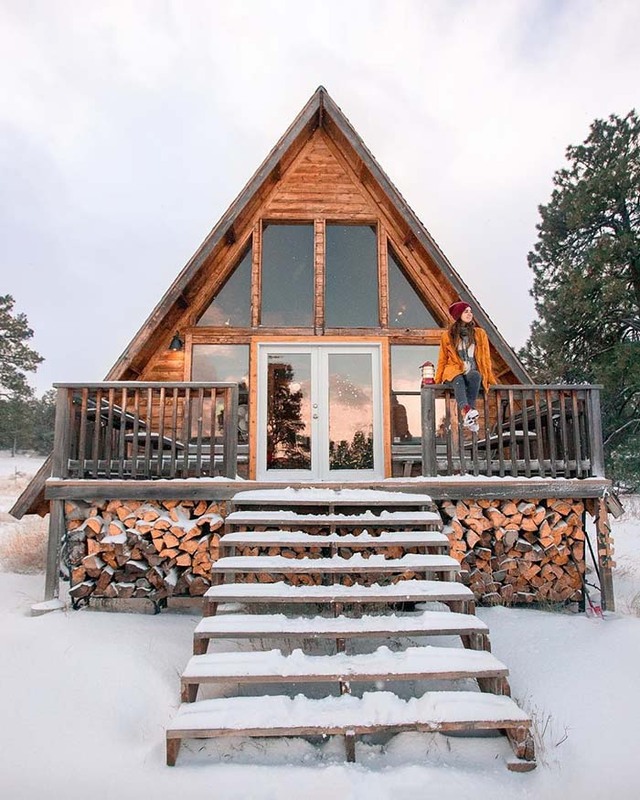 I’m thinking that resting in this extremely tiny but magnificent (and very close to nature) A-frame cabin would lend itself to some marvelous dreams and the sense that you have just time-traveled to a different world. This hand-built escape – limited on space, high on charm – gives you the feeling for a substantial construction thanks to the solid wooden material used. Want to know how the elves and the gnomes live? 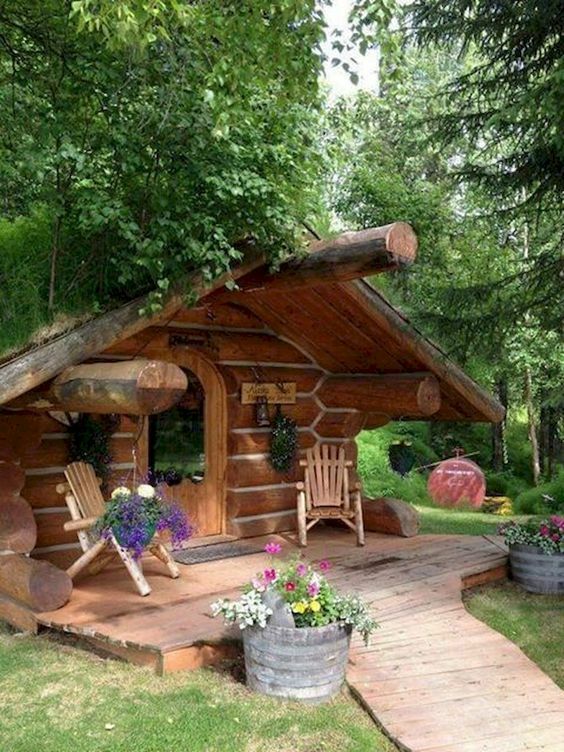 This unusual shaped, pretty cabin log, that costs about $2500, is mainly made out of reclaimed wood. The extra floral elements make it even more welcoming and dreamy. 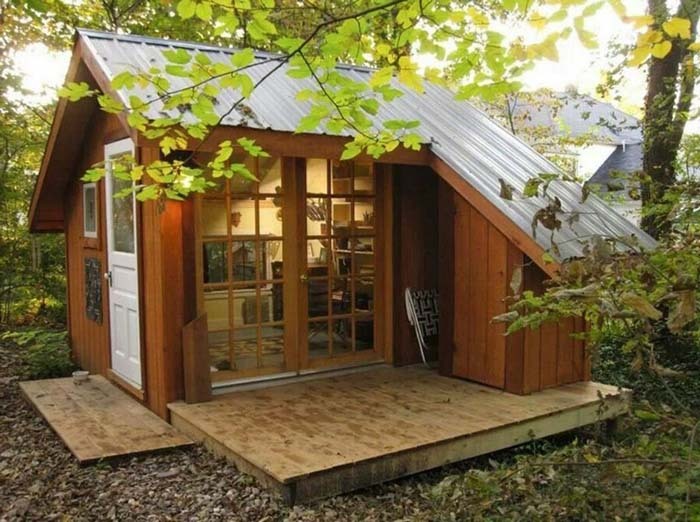 Handbuilt and designed with lots of passion, this tiny, chalet style bungalow is nestled away in a lovely rural area but is still just seconds away from downtown Olympia, Washington so you can dive in the local culture and night life as well. 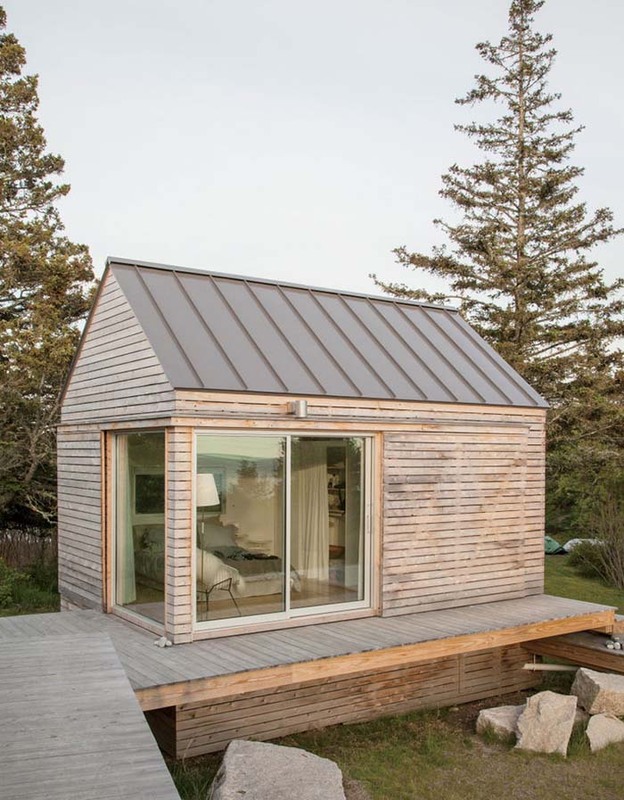 This lovely teeny tiny timber cabin features floor-to-ceiling wood paneling and large windows that let the sunlight entering the little space. 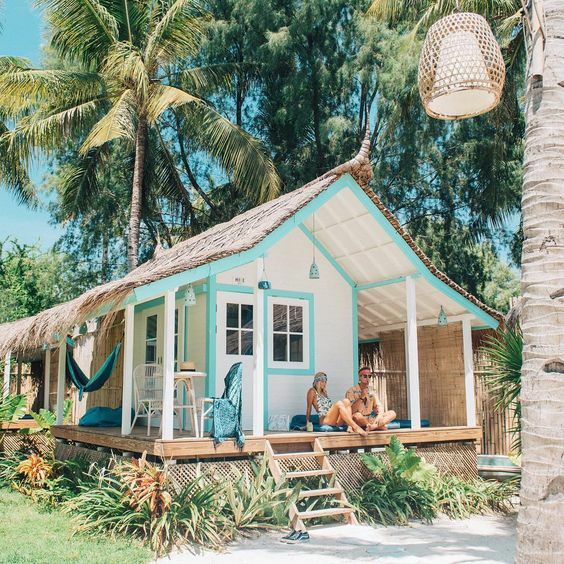 However, keep in mind that, opposite to most of the tiny green cabins, this one does not have a deck to enjoy the surrounding. 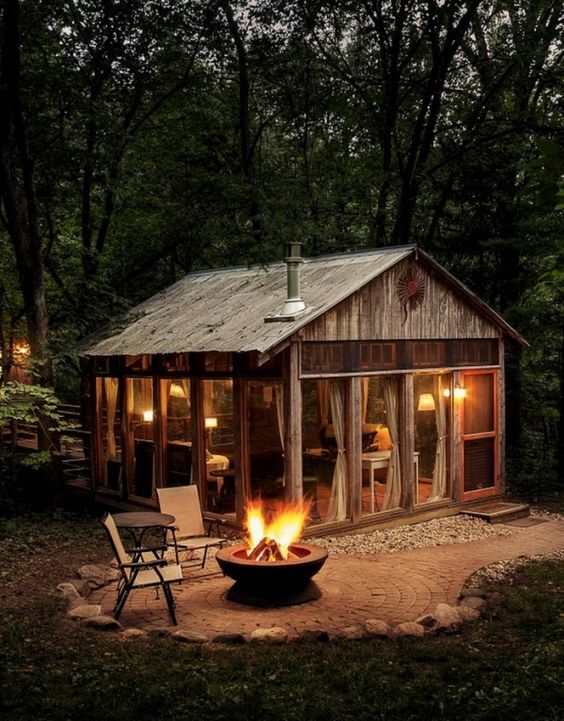 I love the tiny cabins in the woods, built around trees, which makes them look even more compact and unique. Moreover, they won’t cost a fortune if you use reclaimed wood and other recycled materials. This lively, colorful bungalow is the perfect choice for a summer home on the seaside. The straw roof provides enough shade so you won’t get burned while the deck is pretty spacious to enjoy a glass of Mojito. 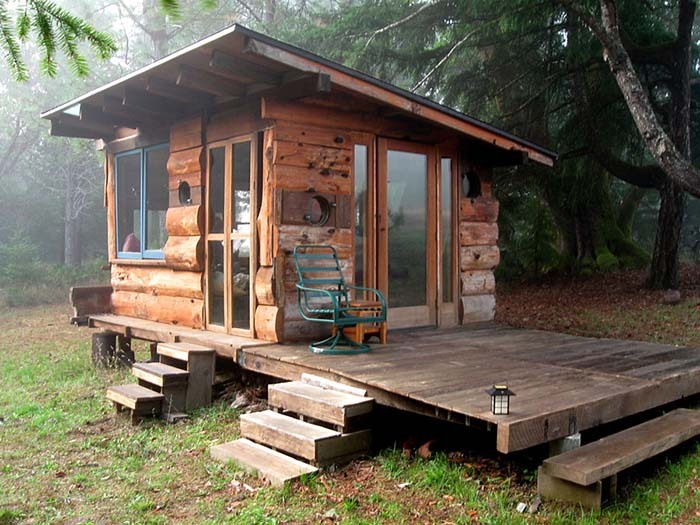 One of the biggest advantages of the tiny cabins is the fact they can built almost everywhere as they don’t need to much space. 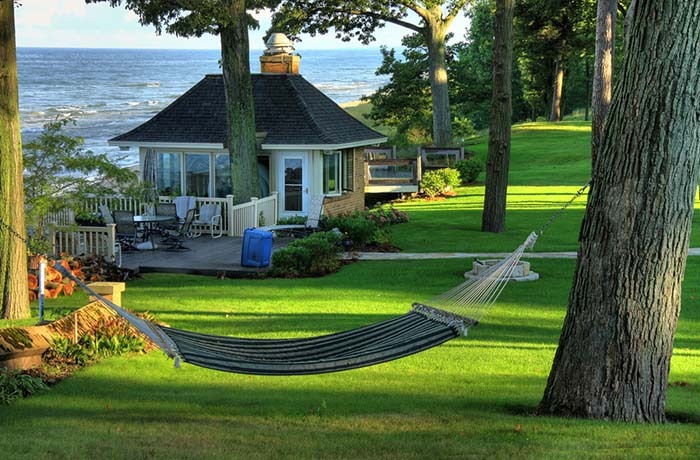 Choose a spot where you’ll be able to enjoy a breath taking view and keep your mind away from the everyday problems…such as this summer cottage around a lake. 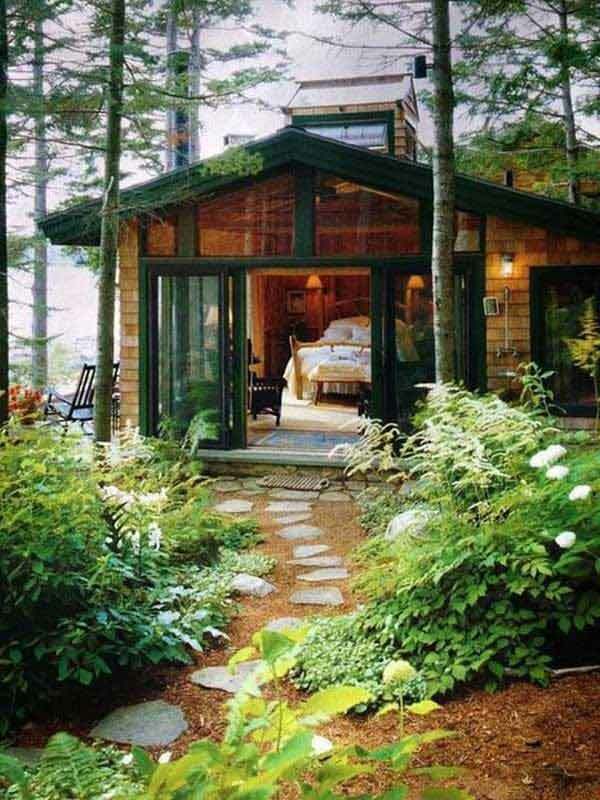 This wood hut might look very simple to build due to the basic, classic design, however, don’t let it fool you! 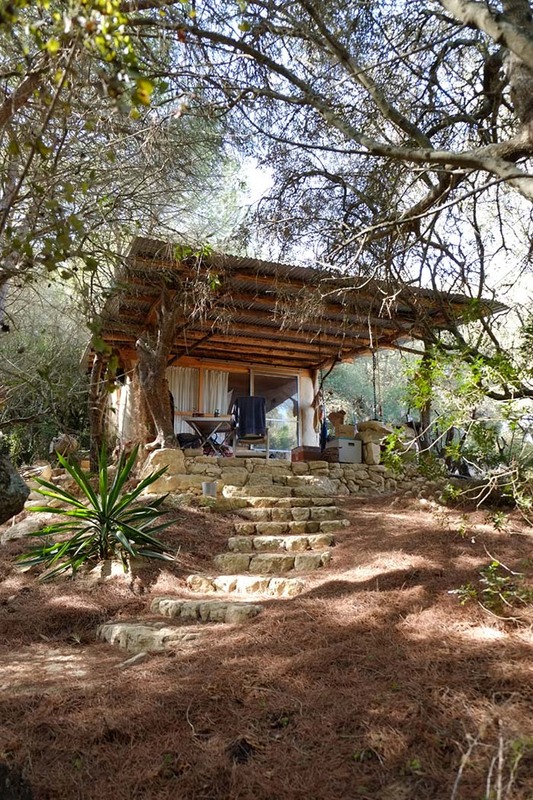 This home, located deep in the forest, can really be turned into your dream-hideaway with a little creativity and research. 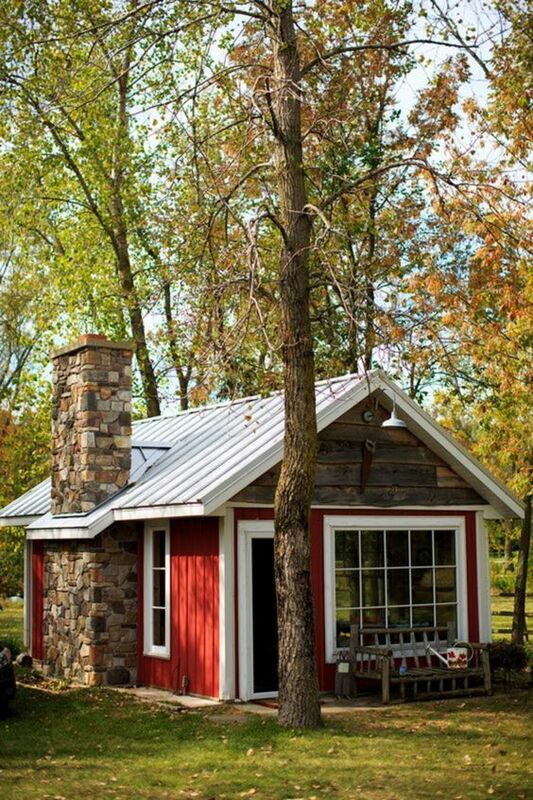 This tiny house is a whole family mension, offering something for each one of you. See, you are getting a home with a basement, one bedroom, one bathroom, living room space, and a kitchenette. That is a lot to be given in one tiny package, eh? Who needs more than spending half of the year in one of the Spanish or Greek islands and a simple roof above the head? This primitive, rustic nest offers everything needed but still keeps you away from the busy city life. 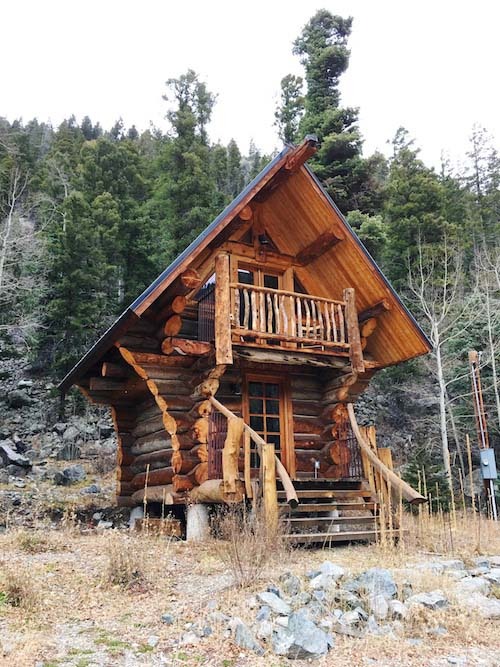 This cabin sits on a remote site in the woods. Quadratic in shape, this constructions allows a full usage of the available space. 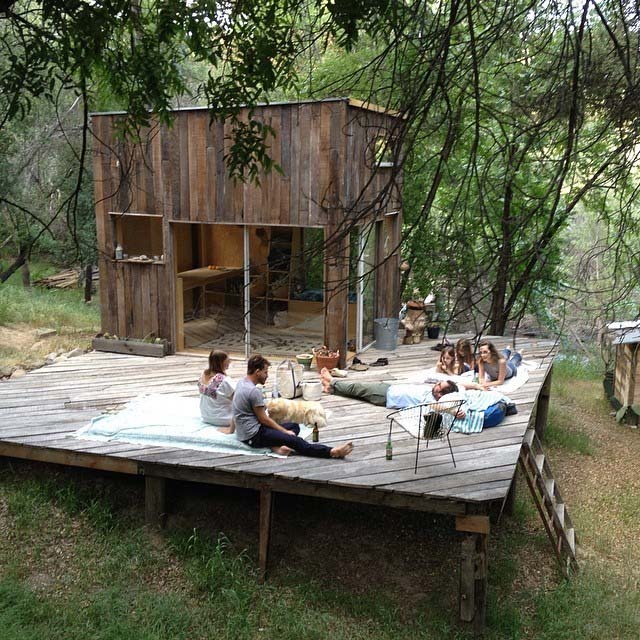 In order to minimize the irregularity to the landscape, a considerable part of the cabin is lifted above the ground. Depart from the city with a short rest on one of these exceptional and inspirational tiny green cabins. Or even building one of these for you and your family? This surely is a lot of people’s dream life. 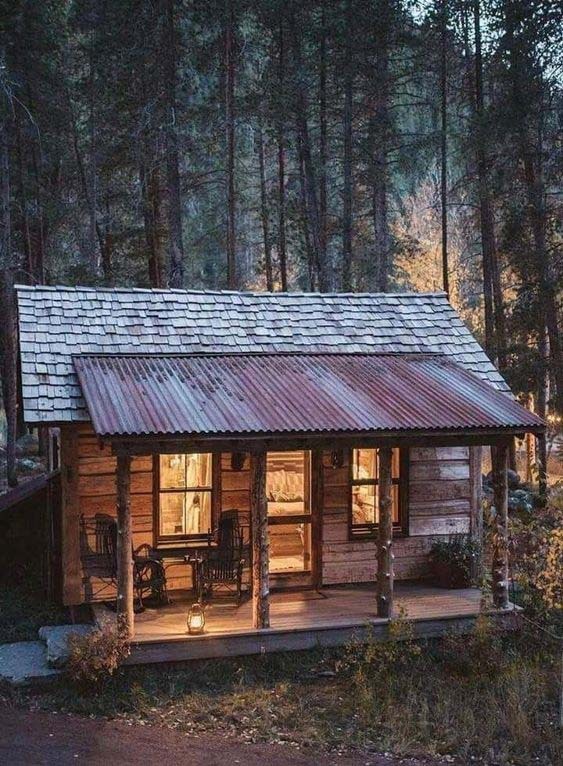 Imagine yourself sitting in a cozy wood cottage by the hot fireplace, feeling the fresh air, at night going outside for stargazing is spectacular!